A four pack of utility hooks that you can hang almost anywhere without using tools, hardware or even glue. 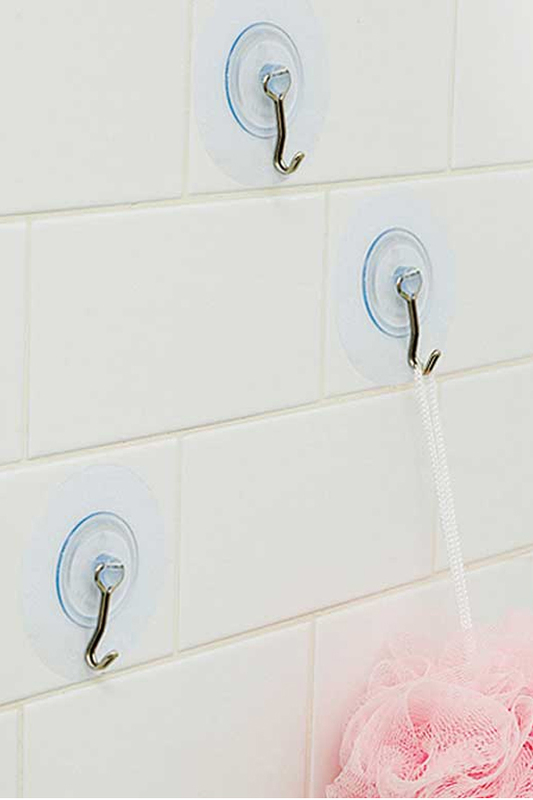 They look a little bit like suction cups with stainless steel hooks, but the friction mount system on this product offers a far superior install. Each one will hold up to ten pounds, and they won't slip, slide or pop off like bulkier, suction models do. Once installed, each metal hook will appear to be cemented in place, or permanently attached with screws, but they will remain completely removable and reusable. Hang seasonal decorations on a door or window, keep oven mitts and utensils close in the kitchen, store brushes and sponges right in your shower, support lint brushes in the laundry room, hang jewelry in the bedroom, or dangle your car keys right next to the door. They work in wet or dry environments, and will adhere to any smooth, flat surface. Installation only takes a few seconds, and if you decide to re-position, there will be no mark or residue to worry about. Stop getting frustrated with inferior products, and don't limit yourself to traditional wall hooks. Simply stick, press and hang more weight than you ever thought was possible. The possibilities are nearly endless. 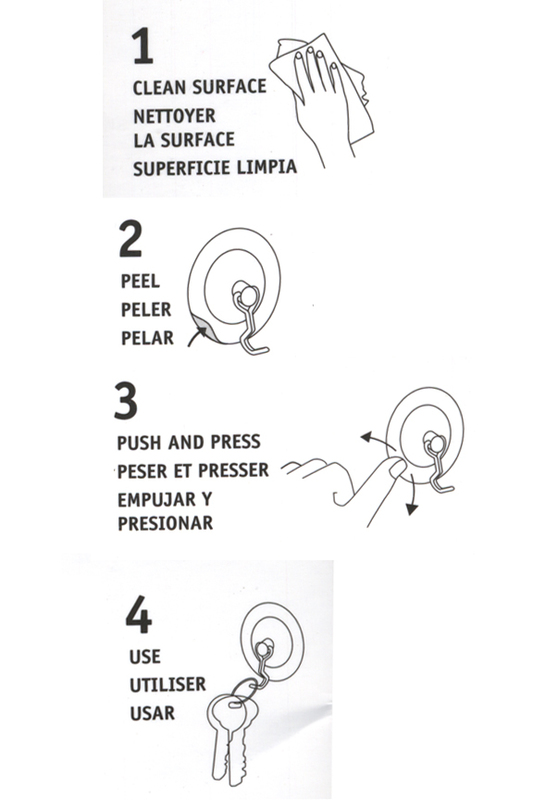 Use them on any smooth surface,a nd they will remain permanent. They are perfect for your kitchen, laundry room, office or bathroom, and they will make it easy to hang all sorts of stuff. They won't work on deeply textured surfaces or materials that normally resist suction like drywall and wood, but everything else is good to go. The following list offers some common uses, but anything similar will also work. So simple and effective, there is no no glue, licking, screws or effort required. You can install one in a matter of seconds, and if you need to take it down or move it, you can do that just as quickly. Once in place, you will have the look and feel of a permanent install. It looks like a suction cup, but mounts closer to the surface, does not move, and holds more weight without failing. Friction mount is a patented system of adhesion that grips with amazing strength. It combines a traditional suction cup with a vinyl sticker to create a much stronger, and longer lasting attachment method. All of the annoying aspects of suction technology have been eliminated to create a reusable mounting system that holds strong, and looks like a permanent fixture. Unlike bulky cups, these lay completely flush against the surface. Once installed, it will not spin, flop, slide or pop off because increased grip provides a much more permanent solution. It can be mounted in a matter of seconds, moved multiple times, and when in use, it will feel like you screwed it in place. This clean looking system is one of the easiest and most convenient ways to have a storage hook in any location in your home. Order Yours Today! Uses Hang just about anything, and keep it in a handy location. They adhere to any smooth surface and support up to ten pounds without sliding or falling off. Perfect for bathroom, kitchen and laundry room applications. Compatibility Install almost anywhere. Works on smooth surfaces like glossy tile, acrylic, fiberglass, stainless steel, glass and more. Includes adapter sheet for use on slightly textured surfaces like matte tile and certain metals. Will not work on drywall or porous wood. Utility hooks that install without tools, hardware or glue. Achieve an incredible bond that is long lasting, but easily remove, reuse or re-position if needed. 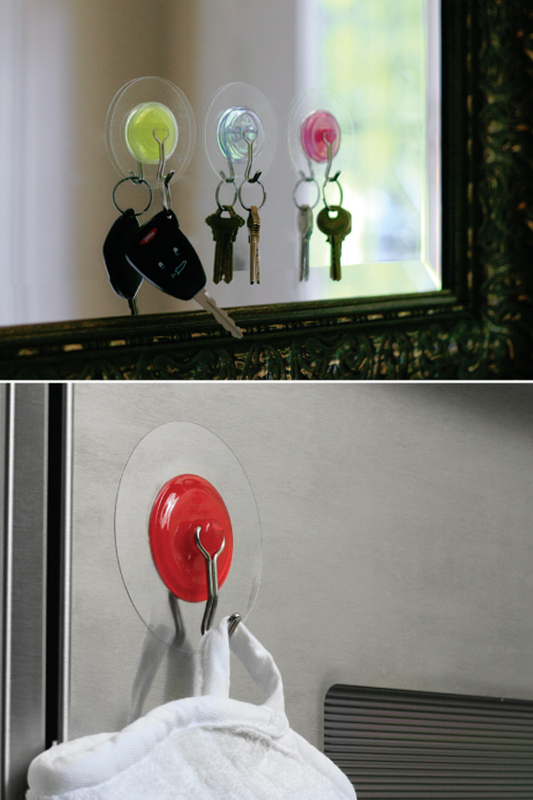 Hang stuff in convenient locations. Order Yours Today. using to hang scrub brush and the wife's poofy thing. still holding strong after a month and they get wet everyday. I make stained glass and have found that standard suction cups usually give up after time and often damage the stained glass. I bought a couple packs of these mounting hooks and they work extremely well. Going to be ordering many more packs to give out with all my stained glass. Super easy to mount and nearly invisible on the glass. I use these in all our bathrooms....they hold those bath puffs easily and they can be taken down and moved very easily! I bought this so my husband could hang his shaving mirror from it. Sadly, the handle of his shaving mirror is too thick to fit inside the hook. What is the distance from the wall/surface to the "usable/hangable" notch in the hook? I'm looking to hang pots, skillets, utensils/ shower accessories etc. all of which have different holes in the handles and R of varying depths? The actual hooks are able to rotate out to accommodate larger objects. They are not fixed at one distance from the wall. How much weight. Will it support? Each hook can support up to ten pounds. Can these be used on outdoor metal facia to hang Xmas lights? Are they temperature sensitive? Yes. They would work for this. They hold well at a range of temps. Do they work on painted walls or wood? The surface needs to be really smooth, but yes, in some cases they will work on these surface types. Can i use them on a glass window? Yes you can. 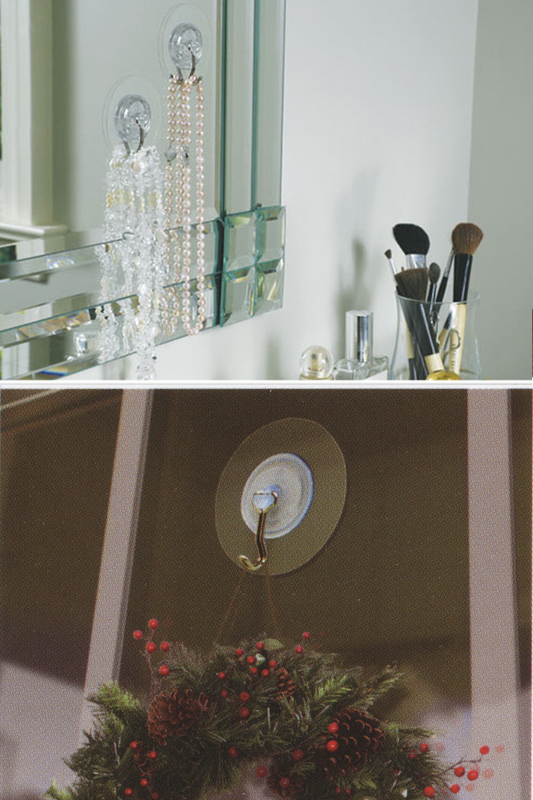 They work great on windows, doors and mirrors for hanging decorations or items of importance. I'm thinking of using these on our picture window to hang holiday decorations, and so would want to remove them after a couple months. Will there be a residue on the window glass after the product is removed? If so, how might I clean/remove the residue? Thanks much! There will be no mark or residue when you take them down. These are perfect for seasonal decorations, and they are totally reusable, year after year.